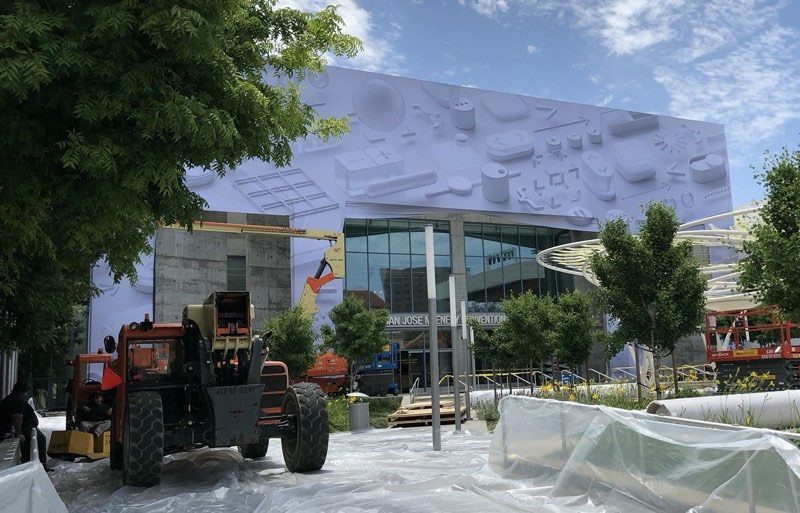 The 2018 Worldwide Developers Conference is set to kick off in five days, and ahead of the event, Apple has started decorating the McEnery Convention Center in San Jose, California, which is where the conference will take place. Apple's WWDC 2018 convention center decorations feature the same design as the rest of Apple's WWDC imagery used for the WWDC site, invitations, and app, featuring 3D buttons, toggles, and text on a white background. Apple has taken over the entire front entrance of the convention center, as it did with last year's decorations. Additional banners and decorations will be added over the course of the weekend. Since last year, Apple has been hosting WWDC in San Jose, a departure from the many years where the event was held at Moscone West in San Francisco. The San Jose location is closer to Apple's campuses and office spaces in Cupertino and the rest of the South Bay, and it is also more affordable for developers due to cheaper hotel options in the area. Apple's 2018 Worldwide Developers Conference will begin on at 10:00 a.m. Pacific Time on June 4 with a keynote event where Apple is expected to debut new versions of iOS, macOS, tvOS, and watchOS, perhaps alongside a few hardware surprises that could include refreshed Macs and iPads. We'll have live coverage of the keynote event both here on MacRumors.com and on our MacRumorsLive Twitter account. Make sure to tune in after the keynote too, as we'll have ongoing coverage of Apple's announcements and new software features throughout the week. Apple's WWDC 2018 convention center decorations feature the same design as the rest of Apple's WWDC imagery used for the WWDC site ('https://developer.apple.com/wwdc/'), invitations ('https://www.macrumors.com/2018/05/22/apple-sends-media-invites-for-wwdc/'), and app ('https://itunes.apple.com/us/app/wwdc/id640199958?mt=8'), featuring 3D buttons, toggles, and text on a white background. I wonder if they’re going to be updating the GUI at all; I’d love to see iOS’s current design scheme with a bit more depth. Who's ready for Summer watch bands!? Why don't they start hosting these events at Apple Park? Thought that was one reason for such a grand auditorium etc. You're forgetting that WWDC is a 5-day conference with 100 learning sessions, hands-on labs, and other events. Every time I see those UI elements scattered all over, I can only think of 3 things it must mean. * They are redesigning iOS UI elements and making them all white/clear and somehow adding depth to the elements. * They are adding some kind of AR interface and it uses the UI elements from iOS but in 3D. * They are adding a theming capability to iOS 12 and so you'll be able to perhaps grab themes from the App Store? Might explain why all the UI elements look white/clear, because they are essentially "blank", since no theme is applied in the WWDC image? Either way, hope it's the first option since they already were rumored to completely redesign iOS 12, at least until the rumors then said it had been pushed to next years release to focus on bugs and optimizations for this release. Mac Pro and displays news at WWDC please! "3D buttons"? Please let it be the herald of the death of the Touch Bar. Another vote for the Mac Pro. Give us something - it's like living in the desert for us. Don't care about watchbands, bad headphones (Sennheiser is better). I don't want to have to switch to PC... Come on Tim, don't fail us.